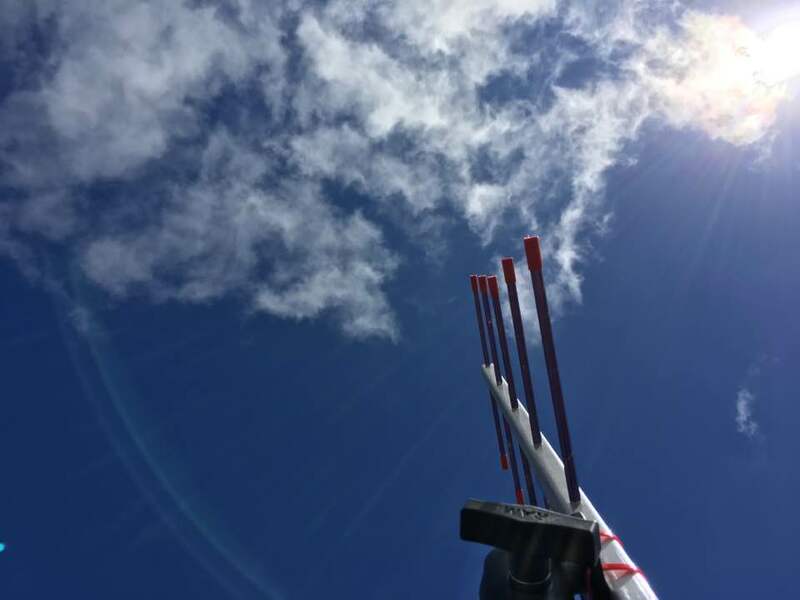 On Monday January 2nd 2017, the Amateur Radio Experimenters Group launched a test flight of some new telemetry equipment, and trialed the updated Wenet SSDV system being developed by the group. The aim was to validate some new software ready for a dual flight being planned for January 22nd for the Southern Hemisphere Space Studies Program (SHSSP) run by the University of South Australia. RTTY Telemetry (434.650 MHz 8N1 ASCII 100baud) – The usual RTTY payload as has flown in the past. Secondary Test Flight Control Payload (TDMA) – In-air test of new TDMA software updates. Wenet had been upgraded this flight to send back 1920×1080 frames and include on each frame some telemetry information too! On the ground, we had a large contingent of members from the Project Horus team. Matt VK5ZM lead the assembly of the balloon payload train while Mark VK5QI tended to the payloads. Grant VK5GR, Josh VK5JO, Gary VK5FGRY and Andrew VK5XFG set about filling the balloon. Liftoff went flawlessly, which meant the chase and tracking was next. As in Flight 39, Peter VK5KX and crew stationed themselves on top of a hill over looking Palmer in the Adelaide Hills. From there, he was able to receive much of the data from the Wenet transmitter carrying the SSDV data. When the balloon reached 15km altitude and was almost directly overhead, he also reported that using a telescope he was able to get a visual lock on the balloon for a time! “We were really trying to run several experiments on our rx capability and do a bit of a shakedown before the Dual launch. Some things worked, some things failed – but we have a much better insight into what is needed. Wenet – both of our Wenet RX set ups worked great – well, WinSDR, Pre-Amp and Laptop with software. We again used a dual-band white stick antenna – so about 8db gain on 70cm. We were able to RX images from 1,800M up to 25,000M and then from 25,000 back down to just 900M! Abovr 25,000M we did see some data, but not reliable at all. Our 2nd Antenna – we used for experimenting with was nothing more than a mobile dual band whip – and we may as well have not bothered from this distance – 4.5db gain does not cut it. Except during the extremes, we had almost 100% decode on all images – well over 100Meg of images in the images directory! We had a lot of trouble even hearing the RTTY telemetry – and it was not until it was about 6,000M that we even heard it! We used our usual set up – of the IC-7100 in the car with a dual-band mobile whip to RX – and this is what we have used in the past without issue – Not so much of an Issue – except that it provides useful information WRT the Az and El of the balloon from your location – which might be needed – especially to be able to track the Payload with a directional array. I suspect that we were had the car parked behind the shed and it was causing us to sit in the shadow of the flight until it hit the 6,000M mark. This is something easily rectified on the next flight – move the car or put the antenna on the shed roof! As usual, the RTTY should be able to be decoded by anyone within about 100km with a fairly simple antenna, further with a little bit of gain. The flight itself was almost a text book affair. The flight track can be seen in the following animation created by Grant VK5GR from the telemetry raw data. The chase tracking for this flight was carried out by three teams this flight. Matt VK5ZM formed a team with Grant VK5GR, Josh VK5JO and Andrew VK5XFG, Andy VK5AKH had a team with Will Anthony VK5AHV, Darin VK5IX and his son Cam, and Mark VK5QI had a team with David VK5DGR and Gary VK5FGRY. The chase teams in particular were using this flight to also get ready for the big dual flight planned on January 22nd. 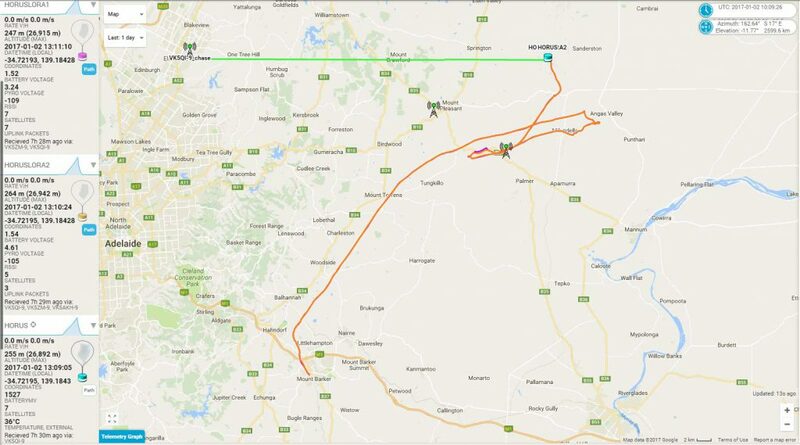 The team had always planned on terminating the flight early as trying to recover the payloads in the Adelaide Hills, particularly the fairly remote eastern side is never easy. There were a number of tense minutes when the trigger mechanism appeared not to work, causing the balloon to fly further east than planned. Our worst nightmares looked like they were then going to materialize with a landing targeting the mountain goat country on the back of the escarpment. Fortunately, the payloads landed in a relatively accessible location, not far from an access road. A short hike up a hill and everything was found intact laid out before us awaiting collection. Everyone declared Horus 40 a success, despite the issues with the delayed flight termination. Some fantastic images were obtained of Adelaide from 26km altitude, encouraging the team to continue to fly the SSDV payloads and enhance the ground station tracking systems. (More on that to follow). This entry was posted in Horus, Project Horus by VK5GR. Bookmark the permalink.